and Beech Court’s owners the ‘Pearce Family’. Grateful thanks for the financial support, and belief in my abilities to enable this innovative creative arts project to happen for the benefit of each resident at Beech Court Care Home. To protect and give privacy to the vulnerable residents I will not be using residents names, we are sure you will understand. This creative project was inspired by creative practitioner Karrie Marshall, who lives in Inverness. I attended Karrie’s inspirational talk at Southwell Library where I purchased the book ‘Puppets in Dementia Care’ followed by attending her ‘Creativity in Care’ two day training course. Both of these strongly influenced my artistic journey of providing experiences for myself and the residents enabling us to communicate enabling us to have some lovely joyful moments together. Karrie provides training courses ‘creative in care’ around the Country. 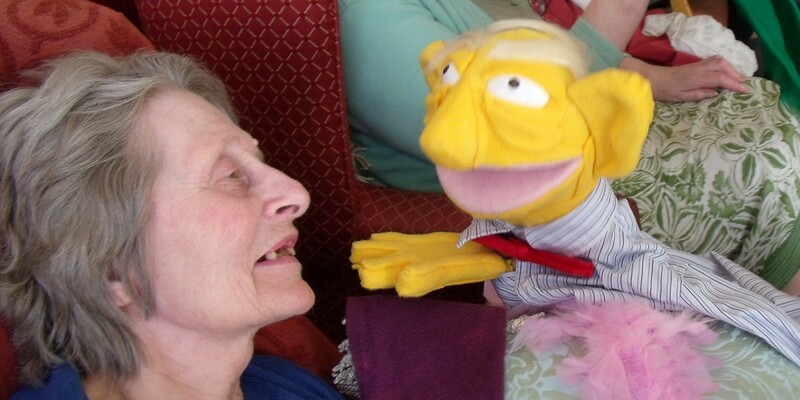 I high recommend the book ‘Puppets in Dementia Care’ by Karrie Marshall.